Kenyans are still waiting patiently for the election results. It has taken a long time and hopefully they speed up things. In the meantime, here is the recipe of mbaazi which goes well with mamri. Coconut milk is used in abundance at the coast and I love the flavour. Feel free to use the tinned variety if you cannot lay your hands on some fresh coconut. 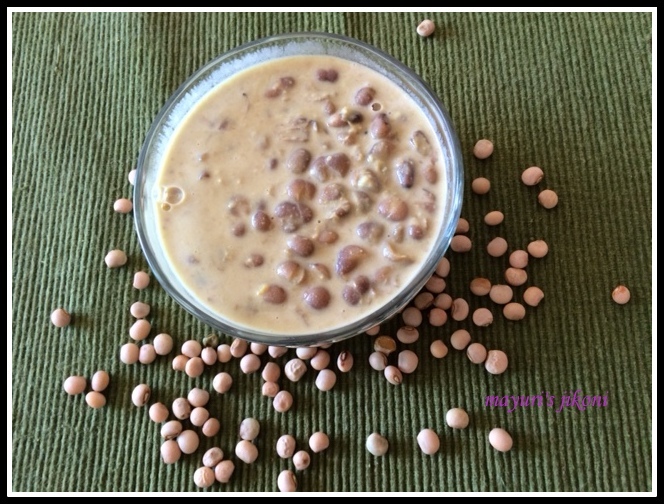 Mbaazi is whole pigeon peas(whole tuvar, toor) cooked in coconut milk. Cooked mbaazi is available readily in the freezer section of Nakumatt, but I prefer the long method of soaking the beans and letting them cook slowly over low heat. Soak the pigeon peas in warm water overnight. Make sure you put enough water. Next day drain out the peas into a colander and wash thoroughly under tap water. Heat oil in a deep pan over medium heat. Add ginger, garlic and chillis. Stir fry for 2-3 minutes. Add water, thin coconut milk, pigeon peas, salt and turmeric powder. When the mixture begins to simmer, lower the heat. Cover the pan and let the mixture simmer till the peas become soft. Stir occasionally. Mash a few peas with the back of a spoon or a masher. This helps to thicken the curry. Add the thick coconut milk or coconut cream. Mix well. Take the pan off the heat. Serve mbaazi with mamri, rotis, ugali or rice. If you prefer, you can cook the soaked pigeon peas in a pressure cooker. Add water and cook for 3 to 4 whistles over medium heat. Mash a few of the cooked peas. Add the rest of the ingredients except thick coconut milk and let it simmer over low heat for 15 to 20 minutes. Add the thick milk at the end before serving. Mbaazi sold on the streets of Mombasa is dry. I prefer the curry style. Feel free to make the drier version by letting the water evaporate. Check out the tip section under mamri on how to make coconut milk at home. If you prefer, you can put slivers of ginger instead of using a paste. If you are using cooked or tinned pigeon peas, you may need about 4 cups. I love coconut milk based curries. This looks delicious and tempting. I have never heard of pigeon peas before, but this looks delicious.